1) It begins with this image, because of the number of people worshipping on Sunday morning the center for our Sunday after-church fellowship has moved from courtyard, to the amphitheater ( the space in front of the FLC). Hundreds of adults and little kids are milling about and at tables. I see a large canopy covering part of the space. This is the common space for the informal gathering of TWO CHURCHES. Yes, two, but not two! Three years earlier FOL started a satellite church, on our own campus. It was started to reach young people, people in our neighborhood, the non-churched. They are people who aren’t very comfortable in a typical church. This church is meeting in the FLC (which has gone through upgrades to make it “worship ready”). They have a pastor, one who “teaches” with his sermon and motivates with unbridled enthusiasm. This is what we refer to here as our “non-Lutheran Lutheran church.” There’s Children’s Church and a nursery needing space for another 20 kids. 2) Also in the Sunday after-worship mix are people who just finished worshipping in the main sanctuary, the Fountain of Life members. There are young and old, each enjoying meaningful relationships. 3) We have three, maybe four services, on Sunday/weekend between Fountain of Life and the satellite church. We are worshipping 500 or more on average. To support this ministry several part-time ministry positions have been created. Technology, communication, music, youth ministry, children’s ministry are some of these ministries. 4) Not seen, but the evidence is clear, is a dynamic small group ministry. This is how the satellite church was started. Twenty new-church small groups are meeting in homes throughout the neighboring community. FOL is also growing through small groups. Its twenty groups are meeting in homes too! Healthy relationships and eager disciples are growing. Works of community service and missions are being accomplished through the small group ministry. Adult Bible studies and kid ministries are still being offered, but the lynchpin of ministry is small group ministry. 5) A Wednesday evening children/youth program is being offered. This takes place in conjunction with many adult small groups gatherings. Kids are dropped off for fun and spiritual growth and parents join their small group. 6) Our neighboring community looks at this church as the church that serves. You see, our goal is to enable all people, young or old, well-off, not so well off, singles, couples, families, all ethnic groups, to LIVE LIFE WELL. We’re not giving handouts, we’re giving a hand up. What that looks like, I’m not sure, but it will look like what the Holy Spirit wants it to look like. 7) Besides the upgrade in the sanctuary, other renovations have been made on campus. These have been funded by “special gifts”, gifts over and above regular offerings. A small group of active members have prioritized the projects and determined the timing of their start. The group is working with the pastor seeking donors, or other funding sources, for these projects. 8) Because of the growth the senior pastor, associate pastor and the congregation are determining what and who the next fulltime ministry staff person will be. 9) New ful time avenues of ministry are being planned, maybe a senior daycare, maybe a preschool, maybe an after-school mentoring/tutoring program, maybe something that I’m not seeing today that is critical for our community to LIVE LIFE WELL. The church is praying and seeking the Lord’s guidance. Whatever it may be, we’ve counted the cost and determined the long-term financial plan to begin this ministry. Hopefully the planning started three years earlier. First, we must count the cost. Imagining ministry, stepping out in faith, taking risks, means trusting God. Yet God doesn’t send His disciples out to the world without means to achieve the future. We need to plan and implement and use our resources wisely. Second, we must honestly consider the mistakes of the past and agree to avoid them in the future. Let’s not let mistakes hold us back, let’s learn from their lessons and move forward. However, mistakes will be made in the future, we are sinners and have no “crystal ball” to see ahead. Instead of casting blame when a mistake is made, we will practice forgiveness, and work to turn the problem into a success. We need to leave to God the Holy Spirit the ultimate success of our plans. Also, as a sort-of aside, if we say we’ve figured it all out, what part did God have in this? Thirdly, we must agree to the non-negotiables. All that we do falls under our vision and mission. As an example, if we call a pastor to start a satellite church, then that’s what the pastor does, until we all decide that something has changed and we need to go a different direction. Another example, if a program or ministry is designed to reach the unchurched, and we believe it must stay that way, then we need to decide who or how to maintain the integrity of the ministry or program. Or, if we agree to a commitment to every member attending Financial Peace University, we start doing it and continue with new members, we keep doing it. Fourthly, we must work together and we must work hard. In our situation we are working from a position of weakness. Instead of riding the sails of success we will be turning the boat hard to port or starboard, changing our course or direction. It may feel abrupt, maybe we’d like to spend more time considering the change. Time is not on our side. It will take plenty of faith, commitment, planning, work and risk to achieve the success of the future. 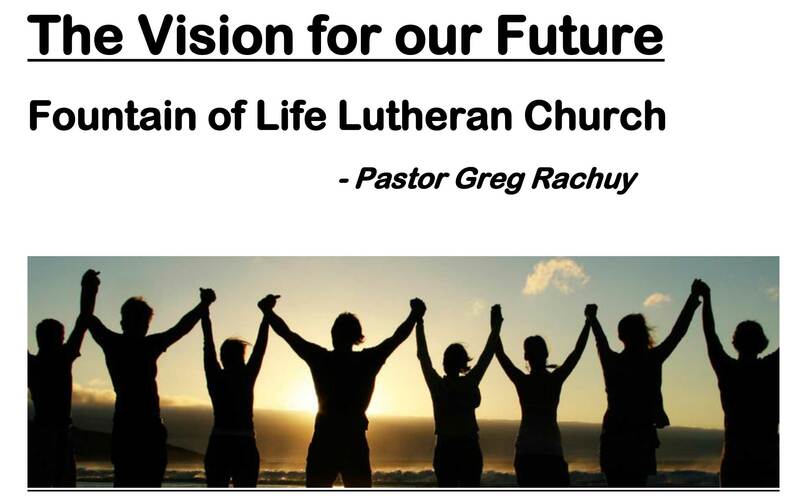 Our vision and mission is what steers the boat. It defines what ministries we do, and don’t do. 1) Critical support staff positions and hours will be reestablished. We fill the groundskeeper position and increase to pre-May 2018 levels hours in maintenance, custodial and setup allows us to keep our campus looking great, and keep up with maintenance. 2) Our congregation will need to call a pastor to be our “church planter” in 2019. His target installation would be June. The calling process would begin in January with a formation of a Call Committee. 3) The DCE position will be vacant, most likely not filled until 2024 or after. We have had a long history of DCEs but currently, with the low number of youth and children, we do not need a fulltime ministry person in those areas. Volunteers and part-time staffing would need to manage until the satellite church is fully functioning. The salary and benefits of the DCE would be set aside for the new pastor.